Australia can be one of the toughest destinations to get to on miles if originating in the US. It really isn’t that difficult, though, assuming you plan in advance and are at least a little bit flexible. I swear that half of people who contact our award booking service seem to want to plan a trip to Australia over Christmas about six months in advance with no date flexibility, and that’s just nearly impossible. But there’s one other way that I think is often overlooked. It’s not the most direct way to get there, but it’s an extremely comfortable way for anyone that thinks getting to a destination can be half the fun. That’s by booking Singapore Airlines Suites/First/Business class through Singapore’s KrisFlyer program. Possibly the most lucrative way to redeem KrisFlyer miles for travel on Australia is exclusively for travel on Singapore Airlines (as opposed to travel on their partner airlines). If you’re originating in New York or Los Angeles, you can fly all the way to Australia on the A380. So it’s by no means cheap, but it’s not a half bad value when you think of how much flying is involved. That’s potentially 12,683 miles in Singapore Suites Class! In terms of pricing oddities, when traveling to Australia, Singapore actually charges fewer miles for first class from New York and Houston than from Los Angeles and San Francisco. So New York to Frankfurt to Singapore to Sydney would cost you 116,875 KrisFlyer miles plus $543.60 in taxes/fuel surcharges. That’s potentially 14,153 miles in Singapore Suites Class, and a journey that stops on four continents! Assuming you don’t have quite that many miles, Singapore Airlines also has very reasonable redemption rates for travel between Singapore and Australia. 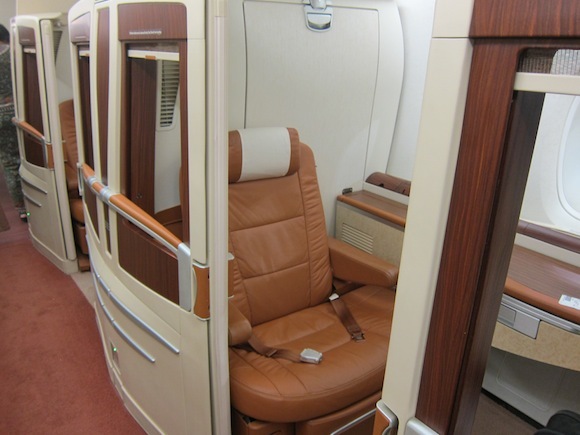 They charge just 63,750 KrisFlyer miles for Suites Class. 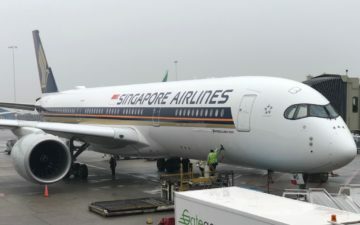 Ultimately there are shorter and cheaper routes on which you can experience Singapore Suites Class, like Hong Kong to Singapore, though I think this is one of the shortest routes on which you can actually experience the product and get some rest. 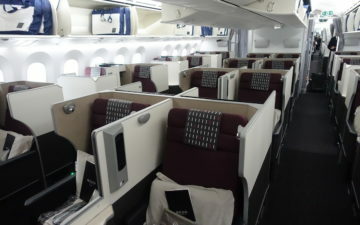 Until somewhat recently, Singapore Airlines only released one Suites Class award seat per flight on routes to the US. That was rather unfortunate, because one of the greatest benefits of Singapore Suites is the “double bed,” which it’s somewhat difficult to fully enjoy alone. However, as of late Singapore has started sometimes releasing two Suites Class award seats per flight to the US, which is exciting. Availability isn’t good at all close to departure, but if you plan far in advance availability is good. For example, looking at availability for next May, more than two thirds of dates have two Suites Class award seats available from Los Angeles to Tokyo Narita to Singapore. Singapore KrisFlyer opens up their award calendar 355 days before departure. As a reminder, Singapore allows one stopover on a roundtrip award. If you just book a one-way then you’re not allowed any stopovers of more than 24 hours. 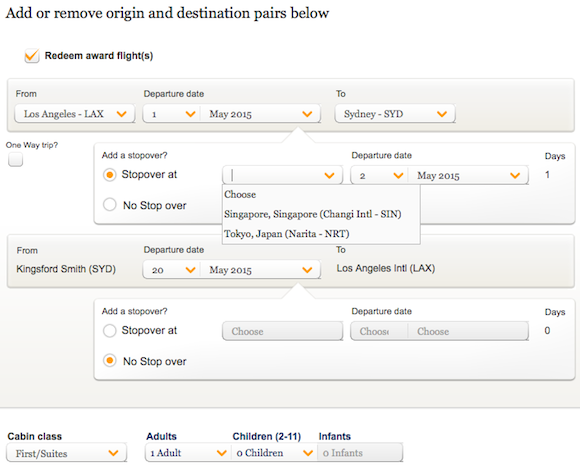 To book a stopover, simply select the “Multi-City” option on the award search page. It’s not the cheapest mileage option in the world, though if you’re into premium cabin travel and think getting there is “half the fun,” then it’s definitely worth considering. That’s especially true for an aspirational trip, like an anniversary or honeymoon, assuming your significant other enjoys flying as well. If you don’t have enough miles to redeem for Singapore first class to Australia all the way from the US, you can instead redeem for travel between Singapore and Australia for fewer miles. On Wednesday a Delta 777 was apparently jokingly told to go around on landing. But what's worse here, the joking controller or the media coverage? Does British Airways offer a good first class product? A look at their seat, service, food,a and lounges. Hi, do you know how often AMEX MR does a transfer bonus to SQ Krismiles? How about if i’m already based in asia? Taiwan / Shanghai? What would be best use of miles to get to Australia from these two origins? i got US, AA, UA miles and SPG points to choose from. thanks in advance! @ ORDOGG — I’ve never seen one before. @ AC — Well if you were redeeming KrisFlyer miles you could book PVG/TPE-SIN-SYD/MEL. But if you have those mileage currencies, then maybe US Airways or American miles for Cathay Pacific business class would be the best option. super fast reply! thanks i’ll keep that in mind next time if my parents wanna go to Australia sometime. I have another idea for those people….don’t go to Australia over Xmas break! Ayer’s rock is a bad idea at the height of summer, the weather around Cairns and the reef is rainy and humid, Melbourne weather can still be unpredictable (was cold and rainy early this January). And Sydney becomes a giant money pit near NYE. Go to north Australia in August – October and the rest either before like November, or in Feb – April. How often do you see 2 suites seats ex-JFK? @ Bgriff — Not as often as out of LAX, but with a bit of flexibility it’s possible. What are the taxes and fuel surcharges to go from Singapore to Australia? 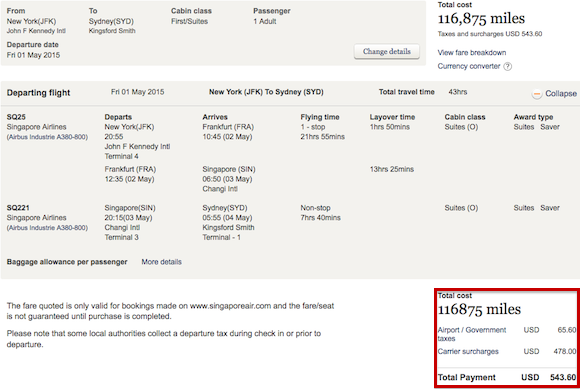 @ WB — Singapore to Sydney one-way in first class is 264SGD including taxes/fuel surcharges. Do the flight times allow for a quick transfer from LAX-NRT-SIN continuing on to Sydney or would it typically require an overnight or extended layover? @ Noel — With the current schedule, you can have a layover of a few hours prior to continuing to Sydney, though it will be a 777 from Singapore to Sydney. Or you can have an ~18 hour layover and fly the A380 from Singapore to Sydney. Don’t forget that the great value, one way suites class award from Sydney to Singapore can be extended to include the leg from Singapore to Hong Kong at no additional cost, making it an even greater deal! Thanks Lucky. @ Mikey I assume the same is true vice versa i.e. HKG to Sydney would still be 63,750? how much do taxes/surcharges increase? @ WB — That’s correct. Difference in fuel surcharges is marginal. Does that mean SIA doesn’t charge extra miles for the stopover, say in Narita? Another question: Do you know how much taxes/fuel surcharges SIA charges from LAX-SIN-LAX? @ Frank — Correct, there’s no extra mileage required for one stopover on a roundtrip award. The taxes and fuel surcharges on LAX-NRT-SIN are ~$340USD. If you want a stopover and there’s no Saver availability for your preferred dates for both flights, Standard may be acceptable. – We want Zone 12 (Europe II; FRA/DME/etc.) to Zone 7 (Japan & S.Korea) with a stopover in SIN (Zone 1) in Business. – Without stopover, Europe-SIN-NRT will be 92,500 in J (78,625 after 15% online discount). – With stopover, we can book it as two Saver one-ways: Europe-SIN (80,000) and SIN-NRT (40,000) which comes out to 120,000 total (102,000 after discount). – We can book it as a Standard one-way which allows 1 stopover by paying 145,000 miles for Zone 12-Zone 7 award (123,250 after discount). – Bottom line: for 21,250 miles you may be able to get more convenient dates as there’s greater Standard availability. Now, that’s obviously a made-up example but I just wanted to show that if you a fairly locked-in for dates and/or don’t have much flexibility, you can pay a little bit more to get what you prefer. P.S. Also, watch out for items marked with a cross on SQ chart: it indicates no stopovers are allowed, e.g. Zone 13 (USA/West Coast) to Zone 4 (S.China/Hong Kong/Taiwan). @lucky semi related question. US Agents should be able to let you do a JL/QF Redemption to Australia and back right? @ Muerl — Yes, I would think so. Hi – read your article with great interest ! So I would like to do a trip from Houston to Sydney July 2016 with stop overs, and transferring miles from SPG and Citi. Here is my dilemma.. I tested your routing and I could not come up with any awards .. simply because it say invalid routes ?? @ Andrew — You just searched Houston to Sydney availability? What was the exact message you were getting? It sounds like maybe there just wasn’t award space.